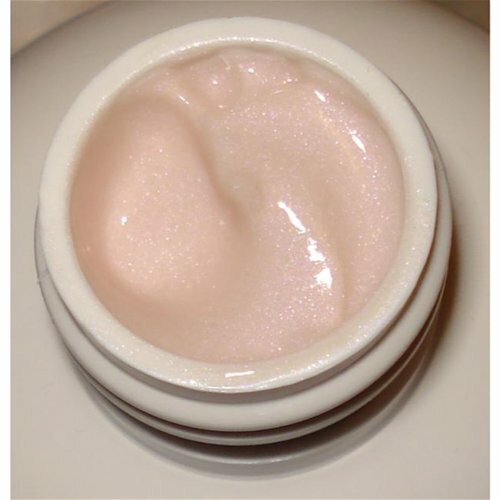 Hi-light's pink mica shimmer and scent is a fun Cake product but not my favorite. The lotion comes in a discreet pink metallic box which makes it perfect for gift giving. The pink tinted lotion is light, velvety, and moisturizing and the shimmery glow leaves your skin looking healthy and hydrated. The bottle is smaller than I expected and it's expensive but the high quality makes up for it. This is definitely a splurge gift that you should at least try once! Pink Shimmer/silver glitter, Smells like fruity pebbles, Moisturizing, Would make a nice gift, ect! Expensive!, The bottle is smaller than my other Cake products, Some may not like the scent. 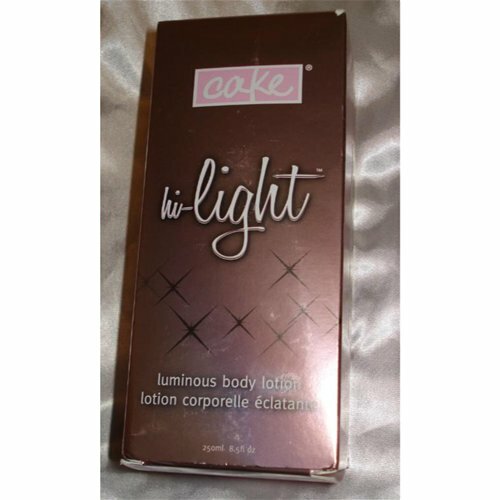 Cake's Hi-light luminous body lotion is a sweet little indulgence that will leave your skin glowing and smelling sweet. If you're looking for a deep moisturizer for extra dry skin or a moisturizer to use on a daily basis I wouldn't recommend this lotion. Hi-light is more like a beauty product in my opinion. It's the finishing touch after you've dolled yourself up. It's the "frosting on the cake" so to speak. 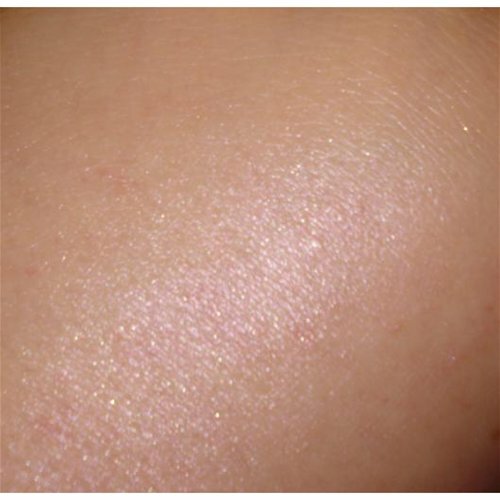 The pearlescent pink mica softens your contours and gives your skin a hydrated and soft appearance. The small flecks of silver microglitter catch the light and gives your skin a luminous glow. Hi-light is used to "higlight" areas of the body such as your arms, legs, and decollete. You can use it in large amounts all over the body if you wanted to but I personally would only use it sparingly because the bottle is a bit small. It's definitely a splurge type of product that would make a really nice gift to yourself or others! 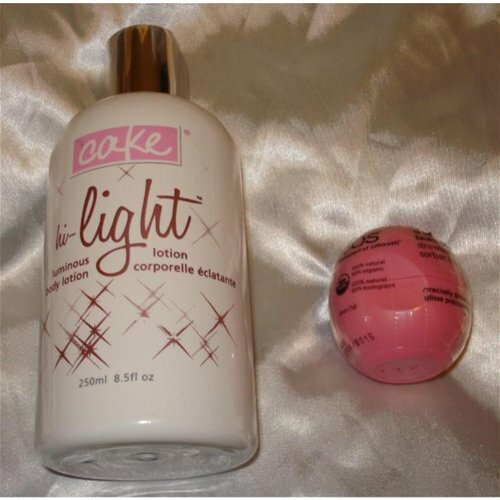 Hi-light would be best for anyone that's already familiar with the Cake brand and knows (and loves!) that Cake makes high quality products that smell sweet enough to eat. If you've never tried Cake before I urge you try this lotion because it's a high quality moisturizer with the added bonus of making your skin look dewy and pretty. Any woman that loves the color pink, glitter, shimmer, and sweet scents would probably love this lotion! Hi-light would make a really nice gift because of the pretty discreet box. You could give this as a birthday gift, a bridal gift, or just give it to a friend. It contains mango, jojoba, and safflower seed oils to nourish and moisturize your skin. I don't see any obvious ingredients that are a red flag for any allergy concerns that I know of. Cake products are paraben free but this does contain dyes and fragrance that some might find irritating. Your best bet is to do a 24 hour spot test on the inside of your arm if you have any concerns or if you have really sensitive skin. The lotion feels like a high quality body lotion. It's not as thick as a body butter and it's not runny either. It's the perfect consistency. When applied to the skin the lotion feels velvety soft and it absorbs into the skin quickly. It doesn't feel greasy or sticky at all. It makes me skin feel really soft and hydrated! If you need deep moisture I'd suggest a body butter. This is a light moisturizer. I wasn't really sure what to expect from this lotion and the scent definitely surprised me! When I opened the bottle for the first time and smelled it my first reaction was, "woah! That smells so familiar but what is it?" After smelling it over and over I came to the conclusion that it smells like cereal marshmallows! It's sweet, milky, and marshmallowy! I like sweet scents but this smells so edible it's almost rediculous. When I wear it I feel like I smell just like a bowl of fruity pebbles. I like it and it's a fun scent but it's definitely not my favorite scent from Cake. I prefer the Desserted Island scent (sweet coconut cake) or the Milk Made (baked raspberry/milk) scent. The product info for this lotion says it's supposed to smell like "citrus/hazelnut" but that doesn't sound right to me at all! If you love the scent of fruity pebbles in the morning then you will love this! At first the lotion scent starts out pretty strong and can be smelled from a few inches away. I've found that most of the Cake products that I've tried so far start out having a strong scent. Over time, the scent starts to wear off and mellow out but it never fades away completely. I used a small amount of lotion on my hands to see how long the scent would last. After a few hours my hands still had the faint lingering scent of warm fruity pebbles but could only be smelled when I put my nose right up against the skin. If you prefer more natural/light types of scents or if you dislike sweets/baked goods scents than you'll definitely want to skip this one! I've never had anything that even comes close to smelling like this and it's completely unique to me. It's one of those scents that most people will either love, hate, or think is just plain weird! I honestly think it's weird and it makes me crave a big bowl of cereal. I don't love it or hate it. This lotion is best used in small amounts. I mostly like to use it on my decollete and on my hands. I don't feel like I want to be glittery and shimmery everyday and I use this sparingly so it's probably going to last me a very long time. I noticed that the pink mica shimmer does "soften your contours" as the products claims to do. The light reflecting mica brings light to darker areas to give you a more glowing appearance. The glitter is a nice silver microglitter that tends to stay put so I really like that! If you don't really like glitter because it's usually too chunky and has terrible fallout you might consider trying this because it's much better quality. The mango, safflower, and jojoba oils in this lotion are very moisturizing and makes my skin feel really soft. The moisture and the shimmer/glitter last for several hours as well as the sweet scent. The only way to completely take the lotion off would be to wash it off with soap and water. I love pink, glittery, girly things and I love this lotion except for the strange scent. The scent makes me crave cereal so bad I can't even begin to explain! If you're trying to watch your weight maybe sweet smelling lotions aren't such a good idea. Overall, I like this lotion a lot but I feel that it has it's time and place. I don't plan on using it daily but maybe on special occasions, holidays, or when going out on a date. I think it's fun and I like it but I also feel like it's something I might not purchase again after it runs out. I'm still giving it a 4/5 because I think it's an awesome product. The lotion comes in a shiny metallic pink box. The box is made of a light cardboard and the inside is white. The box makes a really nice presentation if you're giving the lotion as a gift. The only problem with that is that there's a large barcode sticker on the right side that you might not like if you're gifting this to someone. It doesn't have a price or anything on it (it's just a barcode for inventory I guess) so it should be fine. Unfortunately, the sticker can't be peeled off without leaving pieces behind. This might bother some of you that are planning on buying this as a gift for someone and want it to look perfect but personally it didn't bother me. "Step into the spotlight with this luminous skin perfecting lotion designed to smooth, nourish, enhance, and hi-light your skin. Light reflecting sheer pink mica helps to soften the look of contours and leaves the skin glistening with just the right amount of sophisticated sheen. Shea and mango butters and aloe vera oil moisturize leaving skin sensationally soft. Enjoy supple skin kissed with a pearlescent and luminous glow. Shine like a celebrity at your next event or get noticed everyday of the week. Go on, hi-light your glorious gams, your strong shoulders and delightful decolette. Hi-light all that is you. Indulge." The lotion bottle is made of white plastic and has a white and metallic silver cap. The cap is the type that has to be opened by pressing on the indentation to "click" the bottle open and closed. It can be opened with one hand which is a plus. All the lettering on the bottle is printed right unto the plastic. The bottle holds 8.5 fl. oz. If used sparingly it could last for a long time. The lotion isn't too thick but the bottle is so squeezing the bottle isn't an issue at first but when you start running low and there's less lotion in the bottle the harder it's going to be to get out. Both the lotion and the box are discreet and you would never know it was purchased from an adult website! mica (of course it does! ), titanium dioxide, iron oxides, d&c red #6, #7, #27, fd&c blue #1, #5, fd&c yellow #6, bismuth oxychloride, chromium oxide green, chromium hydroxide green, ferric ferrocyanide (I'm not sure what this is?! ), manganese violet, ultramarines, tin oxide. Paraben free. Made in Canada. This is a fun lotion and I really enjoyed the moisture and shimmer it gives to my skin. I'm not in love with the scent, the bottle is sort of small, and it's expensive. I probably won't be repurchasing this for myself but I might pick it up as a gift for someone else. I'm curious about the gold version of this lotion and I might try that one as well. At first I didn't really love the scent. Now that I've used it more often the scent is really getting to me and now I love it! It smells so sweet and yummy. I wish the bottle was bigger but then again it's something that I only use on special occasions anyway. It's lasting me a long time because I only use it sparingly. Most of the time I just use a tiny amount and use it as a hand lotion. It's on the expensive side and the bottle is kind of small but it's a high quality lotion with lots of pretty shimmer and it's worth it! If you love the smell of cold milk and fruity pebbles cereal then you need to get this! Great review and photos. Interesting that it smells like fruity pebbles. Great review! I can't wait for mine to get here, I already have the gold. Nice review! I love how it looks on skin. Thanks for that photo. Cake has such gorgeous packaging. Love the review! Great review! Thank you for the pictures!